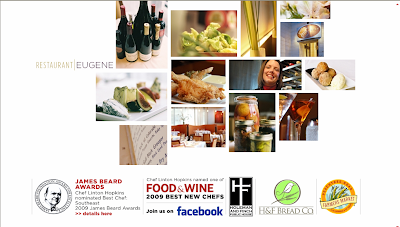 Restaurant EUGENES' Chef Linton Hopkins was voted by Food and Wine as one of the best new chefs for 2009! Suggested by a friend, as a place we might dine a few weeks back and we did....The interior was modern chic, and the staff was very attentive and informative. We both started with a soft farm egg, skillet greens, with peanuts and bacon. Something that I would not normally order but I was intrigued by the mouth watering description. The egg was cooked to perfection sitting on top of the tasty skillet greens, it was superb! Our next course was a scallop, lady pea and corn succotash, excellent mix of flavors, and the scallop was perfect. My main course was yellowtail snapper, tomato fondue, on a bed of skillet beans. Again....very yummy. So far three for three.....Dessert was caramel and chocolate something......Sorry to say, it was so delicious that is all I can remember. A definite thumbs up in my book and I look forward to returning.